The Ottawa 67’s, who have had a pretty busy week so far, are about to get even busier with a 3-in-3 weekend coming up. 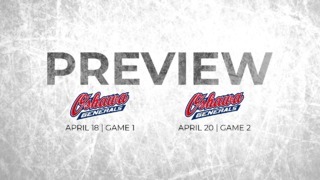 A home-away series will be played on Friday and Saturday against the Gatineau Olympiques with the Alexandra Cup on the line in the inaugural Battle of the Ottawa River. The winning team will then have bragging rights as to who is the best team in the nation’s capital region for this year. If Ottawa does end up lifting the Alexandra Cup on Saturday afternoon, the team will not have much time to celebrate as they will already have to take the ice once again 24 hours later against the Peterborough Petes. Ottawa has had a dream start to the season, with a 22-3-3-1 record and a current 23-game point streak. The Barber Poles got that much more dangerous on Tuesday, as the acquisition of goaltender Mike DiPietro was made in the morning, sending out a message to the rest of the OHL teams that the 67’s are serious at making a deep run this season. Coach André Tourigny has already confirmed that the new netminder will be between the pipes on Saturday against Gatineau. Not only will fans be able to watch the 67’s newest acquisition on Saturday, but they will also have the opportunity to watch the Alumni teams from both Ottawa and Gatineau battle it out before the junior players do, with the Alumni game starting at 12:00. Having won their last three game, Ottawa counts on a lot of fire power offensively. Sasha Chmelevski has been rolling with 21 points in his last 8 games, while they also count on the leagues’ top goal scorer Tye Felhaber, who has scored 29 goals in 29 games. With so much offense, the 67’s now also count on the OHL’s top goaltender. DiPietro leads the OHL with a goals against average of 2.32 and has a save percentage of .920, which is impressive to say the least for a goalie who played for a team that is not considered in the league’s elite. DiPietro totals 86 career wins in the OHL, posting a GAA of 2.52 and a save percentage of .914 and 16 shutouts. 15th overall in the QMJHL standings, this is not the greatest edition that the Olympiques’ have had in their storied franchise. 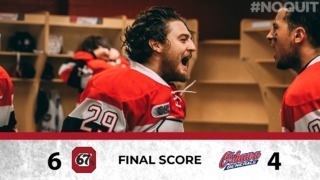 Times are currently tough for the 67’s neighbors across the bridge, as they have lost their past five contests and have only gathered three wins in their last ten games. One thing that could light a much needed fire under the ‘Piques could be a reignited rivalry against the Barber Poles that was put on hold after their last two contest against them last year. The remaining players of the two teams have fresh in their memories the 4-1 win for Gatineau in the outdoor game here at TD Place in December of last year. No love was lost between the two sides in the pre-season, where both teams battled in a couple of chippy contests. In this completely new season, the Olympiques are led by veteran forward Shawn Boudrias, who has put up a team-leading 30 points in 29 games for Gatineau. Another key players for the Olympiques is goaltender Tristan Bérubé. Although he may have not had the start to the season he would’ve hoped for, Bérubé has now been a crucial part of this team for three seasons now, and will look to make the home fans proud by helping bring in the first ever Alexandra Cup to Gatineau. Third in the East Division, Peterborough had a great start to the year. People will remember the 7-3 beating they fed the Barber Poles in September, but it is safe to say that both teams are completely different from that meeting, as most key players on both teams were away at NHL camps. With a record of 5-5-0-0 in their last 10 games, it is tough to say if Peterborough are coming to Ottawa in great form, but they have proved in the past they can compete and even defeat the 67’s. Winnipeg Jets draft pick Declan Chisholm as well as Toronto Maple Leafs draft pick Semyon Der-Arguchinsev have been leading the charge offensively for the Petes, while goaltender Hunter Jones has been stellar, with 15 wins, a GAA of 2.65 and a save percentage of .923. The 67’s will look to be careful on the power play during this game, as they had had a difficult time, allowing a total of four shorthanded goals during that game. 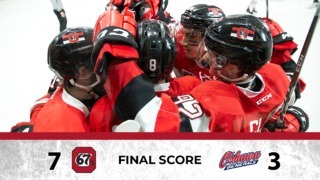 The Ottawa 67’s have a winning record in their history of meaningful games against Gatineau, going 5-3-2 against the ‘Piques. With an ongoing 23-game point streak, the 67’s have taken 38 points out of a possible 42 during this streak. In their last three games, Ottawa has combined for a total of 20 goals. In two games against the Olympiques last season, Sam Bitten put up 2 goals in 2 games, while Austen Keating had a goal and an assists for 3 points.